Mrs Keith Miller, internationally known aviatrix, was taken to the county jail here today and held for investigation by State Attorney’s investigators. Jail attendants said they understood she was held in connection with the shooting of an airline pilot. Jessie Miller, known to those who loved her as Chubbie, has a thirst for adventure. Married far too young, and very unhappy, she holidays in England where she soon manages to sign up for an almost unfathomable quest – as a passenger flying from London to Australia for the first time. Although she and her pilot partner Bill Lancaster are beaten by another plane, Chubbie becomes famous as the first woman to complete the journey. Unable to settle back down to life in suburban Australia, she and Bill travel to America where her various flying feats included flying in the first air race for women with Amelia Earhart. But along with the many highs of a career as a pilot, CHubbie also finds herself facing terrible lows – crash landing in the Flroida Straits, being accused of faking her disappearance for publicity, and finding herself at the centre of a murder trial. The Fabulous Flying Mrs Miller is an absorbing tale filled with twists and turns. As fiction it would seem almost implausible – but this is a true story, set in England, Australia and the United States in the 1920s and ’30s, the golden age of aviation, where adventurous flyers – and the manufacturers and fledgling airlines behind them – pushed themselves to do what no one else ever had. History buffs, aviation enthusiastis will find this story of a remarkable woman fascinating. Most readers will be introduced to Rose Paterson by reading the poems and stories written by her son, Barty, better known to the world as Andrew Barton ‘Banjo’ Paterson. But so subtle are the references that readers may not realise they have made her acquaintance. She is there in Banjo’s turn of phrase, his sense of humour, his resilient spirit and in some rare direct references to her as she was in his childhood. But Rose Paterson, in a series of little-known letters written to her younger sister, Nora, provided her own account of her life. Meet Rose Paterson, mother of A B ‘Banjo’ Paterson. ‘Looking for Rose Paterson’ chronicles Rose’s life as daughter, sister, wife and mother. It also examines the life of a farmer’s wife in a time very different to now. Rose’s letters to her younger sister reveal a world of challenge, from the regular and protracted absences of her husband, to the isolation and inadequacies of her home. Yet she managed to retain a sense of humour, raise and educate her children. She also kept in touch with her family and friends, even when poverty dictated that she cross-write her letters. ‘Looking for Rose Paterson’ includes photos, letters, posters and extracts from Paterson’s poetry. ‘Looking for Rose Paterson’ is much more than a story of an individual life, though it is that too. It’s a rich portrait of a colonial world, with a focus on the often invisible women who helped shape it. In addition, it chronicles the world that nurtured Banjo Paterson and set the foundations for his writing. Rose’s letters offer an intimate peek into matters personal and domestic, while other elements reflect on childbirth, education, women’s rights and more. ‘Looking for Rose Paterson’ is a fascinating read, a chocolate box of delights for anyone interested in Rose herself and in learning about the lives of colonial women. Highly recommended. As he sat in his dingy office, Banjo dreamed of the drovers bringing big mobs of cattle down from Queensland. He stared out the window and longed to swap places with those in the back of beyond. Andrew Barton (Banjo) Paterson is one of Australia’s best known and loved poets. Poems such as ‘The Man From Snowy River’, ‘Clancy of the Overflow’ and ‘Waltzing Matilda’ have entertained Australians of all ages for more than a century. Meet… Banjo Paterson introduces young readers to the man behind the poems, and how he came to write them. Told in simple language the text focusses on key events in Paterson’s life and how these translated to the page. Illustrations on every spread bring scenes to life but also depict the way his imagination worked and, in turn, ignited the imagination of readers. Part of the Meet… series, which brings notable Australians to life in a form accessible to young readers. Suitable both for classroom use and for private reading. James was a very good sailor. He could steer by the stars, make maps and read charts. In fact, he was so good he joined the Royal Navy. Englishman Captain James Cook played a big role in charting Australian and New Zealand coastlines, as well as exploring and having adventures around the globe. In This is Captain Cook, his story is told via a class play presented by Miss Batts’ class. As Cook’s story is told in a simple, accessible narrative, illustrations show it being acted by students on a stage, in front of an audience of family members. Extra interest is added through speech bubbles and through side-stories happening with in the illustrations, such as escaped chickens running amok on stage, and interactions between audience members and the cast. The aforementioned chickens also feature on the end papers. 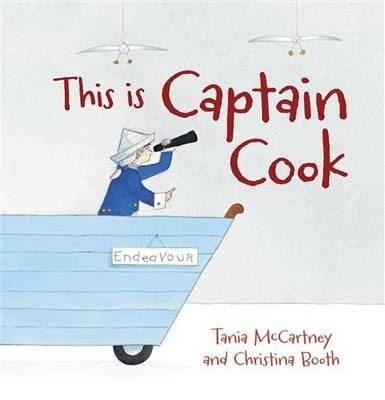 Useful for classroom study but also suitable for private reading, This is Captain Cook provides an entertaining introduction to the life of James Cook. When a young lawyer known as Barty Paterson took some of his poems to a newspaper editor in 1886,he didn’t think his ‘fractured verses’ would stand the test of time. Fortunately the editor thought differently and began a publishing career that hasn’t ended. Banjo Paterson wrote poems, stories, articles and novels. His song ‘Waltzing Matilda’ is more loved than the Australian national anthem, and his face graces the ten dollar note. 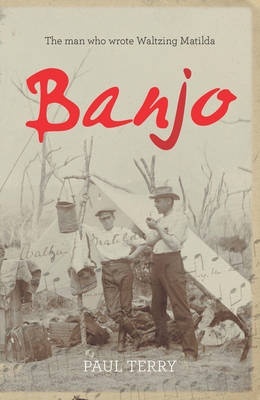 Banjo: The Man Who Wrote Waltzing Matilda offers an insight into the man who became Australia’s best-loved poet, from his birth in rural NSW in 1864 through his childhood and education, his career as a lawyer, his personal life, his travels and, of course, his writing. The life of his famous contemporary Henry Lawson is also shared, in a way that allows comparison and explores their relationship. Similarly, the life of ‘Breaker’ Morant, who was also a friend of Paterson’s, is also touched on. But of course this is Paterson’s story, and so it is he who is the main focus, leading to an understanding of his influences, his life and his work. This is an accessible biography, sure to appeal to lovers of Australian literature and history. Afterwards, standing in front of my smashed car, the attending policeman told me, ‘You should have hit the fakking thing. You shoulda just hit the fakking thing.’ But all I could think was, ‘No I couldn’t. I’m an immigrant and I don’t think it would look very good if I’d killed your national emblem.’ It seemed like the sort of thing that might come up in my citizenship exam later. As a child, Sami Shah didn’t picture a future for himself which involved relocating to rural Australia, nor did he see himself as a stand up comedian. But after growing up in Karachi and studying in the United States, he gradually found that Pakistan was not the place he wanted to raise his daughter. After saving and planning for three years, he and his wife and child found themselves living in Northam, a town they’d never even heard of, and trying to make a go of life as migrants. I, Migrant: A Comedian’s Journey from Karachi to the Outback does much more than trace Shah’s journey to Australia. From his childhood, through to his years living in the United States – including how it was to be a Pakistani Muslim in the US after 9/11 – and his adult life back in Pakistan, the reader is privy to his life, his motivations, and his eyes and lows. We also see his development as a comedian – both in Pakistan, and as he re-establishes himself in Australia. Significantly, we get an insider’s view of life in Pakistan, and the life of a migrant in Australia. Shah’s voice is humorous, but it is also honest and very insightful, so that readers will laugh, cry, squirm uncomfortably and applaud. Mostly, though, you’ll come to feel like you know Sami Shah – and feel so much richer for that friendship. ANZAC is the name given to the Australian and New Zealand troops who landed at Gallipoli in World War I. ANZAC is now a symbol of bravery and mateship. this is the story of how the ANZAC legend began. With 2014 marking the centenary of the First World War, and with ANZAC Day just a couple of months away, the release of Meet the ANZACs is timely. Part of the Meet… series, this offering varies from earlier titles in the series in that it focusses on a group rather than on a single individual. This works wonderfully, with author Saxby developing a sense of who the men were who together created the legend. In a relatively few words we learn of the motivations of those who joined up, their dreams and expectations, the training and difficulties they endure, and their feelings they await their first deployment on Gallipoli. Illustrations, by Max Berry, complement the story, with changes in perspective and focus capturing the range of scenes from bush and city in Australia, to the deserts of Cairo and the landing at Gallipoli. In keeping with the story the illustrations depict a range of men, giving some sense of the range of different backgrounds and ages of the soldiers. As with all books in this series, back of book timeline provides a more comprehensive overview, in this case of the passage of the First World War. 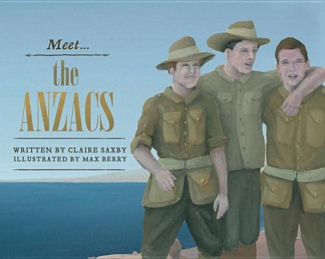 Meet the ANZACs provides a wonderful introduction to the soldiers who forged the ANZAC legend and, as such, is perfect for classroom use but equally appropriate for home reading. Disclaimer: The reviewer has also contributed to the ‘Meet’ series, having authored an earlier title in the series. The review was written with every attempt to consider this title independently. Introducing a new series of posts, where I invite authors to drop in and tell us about their new books. To get the ball rolling, I thought I’d post about my own new release. I look forward to sharing lots of new books this way in the coming months. Meet Mary Mackillop, illustrated by Sonia Martinez, published by Random House Australia May 1 2013. Two reasons. Firstly, because I was asked to by Jeanmarie, the commissioning editor of Random House’s new Meet… series, a series focusing on great Australians. Secondly, because even before I was asked I had long admired Mary MacKillop as a woman who saw a need and set about filling it, even in difficult circumstances. It was a real honour being asked to bring her story to life for young readers. I was approached about writing the story in March 2012, so just over a year. This is really quick for a picture book – my longest was about 8 years. Finding a balance between the history and a story suitable for primary school aged readers. There was so much I wanted to share, and only a few words in which to get it across. For this reason I chose to focus on one year in Mary’s life, and chose the year in which she set up her first school. The wonderful illustrations by the incredible Sonia Martinez. I was delighted when Jeanmarie told me that she had commissioned Sonia, as I have long admired her work. To trust myself. I actually experienced a bit of self doubt when writing this book. I had done all this research and become so close to the story that I got a bit panicky about getting it right. As a result I found there was a period where I couldn’t work. In the end I had to give myself a good talking to and just get words down on the page. As any writer knows you can’t write a book without actually doing some rewriting – and it’s easier to fix a story that’s on the page than one that’s in your head. Once I sat down and wrote and experimented and rewrote and rewrote some more I had a story which worked. I also learnt a lot about Mary MacKillop and the obstacles she faced to take education to children who wouldn’t have otherwise have had access to school. In the midst of a busy week, I blogged, tweeted and also Facebooked about the release, put the book on display in my office at my day job, and also smiled a lot. There may have also been a quiet glass of red and some dark chocolate. I am hoping to have a launch a bit later on. I do a lot of online promotion – on my blog, on other people’s blogs when I’m invited, and on Twitter and my Facebook author page. I also do school, festival and conference appearances (am off to the state ALEA mini-conference next weekend). On a smaller scale, I always have my latest book cover in my email signature line, and I also have an author website, which I am in the process of having redesigned to better promote my works. A few things. I always have several projects at different stages of completion. At present I have two picture books for younger readers awaiting edits, a verse novel waiting for feedback, a collection of poetry I’m trying to pull together and a longer historical story which I’m researching. Not to mention several other stories which are ‘resting’ till I get back to them for rewrites, and a bazillion ideas waiting for me to write them. Enjoyed this post? Stay tuned for more Meet My Book posts in coming weeks. And if you’re in Aussie author who’d like to take part and introduce us to your book, drop me a line. foundation, to ensure that his work continued long after his death. In Professor Fred Hollows, part of the Aussie Heroes series, author Hazel Edwards recounts the key events in Hollows’ life and work in a simple, accessible form. Coloured illustrations scattered throughout the book bring the story to life. Three out of four people who are blind don’t have to be. They are blinded by poverty alone. Frederick (Fred) Cossom Hollows was born and grew up in New Zealand, knowing from a young age that he wanted to make a change for the better. He studied medicine and then decided to become an eye doctor. Moving to Australi,a he recognised the need to take eye care to the people who most needed it, and so set up mobile eye clinics, working in remote and Aboriginal communities providing low cost and free medical aid, and saving the sight of thousands of people. Later, he took his programs to other countries. Before his death in 1992 he established a foundation, to ensure that his work continued long after his death. Hollows is an inspirational character and an excellent role model to be presented to children as an example of humanitarian action, and the power of self-belief and the difference an individual can make. Professor Fred Hollows would make an excellent addition to school libraries and is suitable for classroom use. This book can be purchased in good bookstores or online from Fishpond. Buying through this link supports Aussiereviews. Six-year-old Nellie crouched up in the tree branches, peering down at her father as he approached the dam. She knew she would be in trouble if he found her sitting in the old gum tree, sopping wet, so she decided the best thing was to stay very quiet until he passed. Suddenly, her father looked up into the tree, straight at Nellie. She shrank back against the smooth bark, but she knew it was too late, she’d been spotted. At that moment, she heard the humming, a favourite song of hers that her mother used to sing when she was a baby. After a moment of listening, Nellie realised the humming sounds were coming from her! When Nellie was a child, in the 1860s, singing in public was not considered a ladylike thing to do. But Nellie was determined, from an early age, that singing would be her life. Not long after she finished school, her mother and young sister died. Nellie, her father and a sister moved to Queensland where strong-minded Nellie married an Englishman. Nellie tried to put aside the notion of singing but found it impossible. She sang in Melbourne and achieved some success. But before long she found Melbourne too small for her ambitions and sailed for Europe. There she achieved the success she’d dreamed off and returned to Australia a star. It’s often difficult to comprehend that famous people were once just like all the rest of us, doing normal things, dreaming big dreams. Dame Nellie Melba, international singing star, was once a small child hiding in a tree to avoid getting into trouble. With a good voice and a great deal of determination, she showed that it is possible to make dreams come true. Dame Nellie Melbasets out to tell Nellie’s story, from her origins, through sadness and wrong-turnings to her world-wide triumphs. It makes Nellie real, and her story meaningful and accessible to children today. Aussie Heroes Dame Nellie Melba is the first in a new ‘Aussie Heroes’ series from New Frontier Publishing. Recommended for upper primary readers.